Bullets are a common design device used to organize and draw attention to items in a list. The items may have been extracted from your text, or they may be independent of the text. The basic bullet available in most fonts can get a bit boring, but, fortunately, other options are plentiful. Many symbols and dingbats can make great bullets. Basic shapes, including squares, triangles, check marks, and even simple arrows, often work well, as can various more decorative elements. You’ll find many fun graphics in Webdings, Wingdings, and ITC Zapf Dingbats, which are available on most operating systems. You can also find cool symbols and dingbats as part of some OpenType fonts as well as in stand-alone dingbat or ornamental fonts. Coloring your bullets can provide extra emphasis and pizzazz. A couple of cautions: Pay close attention to the size, position, and alignment of bullets. Keep them graphically simple so they are crisp at bullet size. They should also be in pleasing proportion to the rest of your text. maximum flexibility to change bullet styles on-the-fly. Here’s how to use the formatting features available in your software. From the Paragraph palette, select Bullets and Numbering from the flyout menu. Select List Type > Bullets, and customize as desired. Click on Add to select a bullet character from any font on the Add Bullets glyph palette. You can further customize your bullet — including size, color and baseline-shift — by clicking on Character Style. Create a New Character Style with your desired attributes, then Name the Style and click on OK. 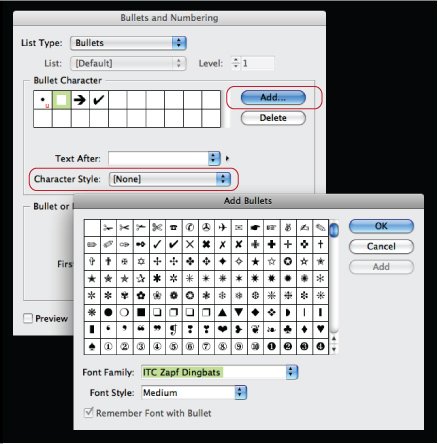 Remember to select the desired bullet from the Bullets and Numbering panel, then click OK.
From InDesign’s Bullets and Numbering palette, click on Add to open the Add Bullets glyph palette to select a bullet style. To fine tune its attributes, go to Character Style and create a Style Sheet with the exact bullet attributes you desire. Highlight text, then go to Type > Bulleted & Numbered Lists > Apply (or Remove) Bullets. NOTE: You can also format and apply bullets via Paragraph Styles. The bulleted list above was achieved with one click after setting up the text and bullet Styles. The text is black, set in 22 point ITC Legacy Square Pro, and the bullets are red, set in 13 point ITC Zapf Dingbats with +1 baseline shift, indented .3 inches. Select Edit >Style Sheets; select New > Paragraph; name it as desired, and format your text as desired. Then select Edit >Style Sheets; select New > Character; and format your bullet as desired. Here you can customize the bullet’s font style, size, color, baseline shift and many other attributes. Read more about Bullets here.